Laura Cividino, born in 1983, received her violin diploma in 2004 with Prof. Diego Masutti and piano diploma in 2005 with Prof. Ugo Cividino, both at the J. Tomadini Conservatory of Music in Udine, Italy. She continued her studies in Klagenfurt, Austria, with Professor Helfried Fister, and in March 2008 received a violin diploma from that school. She graduated with a Master of Music degree in Violin Performance with Professor Andrzey Grabiec at the University of Houston’s Moores School of Music in May, 2012. In February 2014, she received her viola diploma with Luca Morassutti at the G. Tartini Conservatory of Music in Trieste, Italy. During her career she has performed in various cities in Italy, Austria, France, Spain, Portugal, Slovenia, China and the United States. She has been a member of the OAO (Orchester Akademie Ossiach), and of the SFK (Slovenia, Friuli, Kaerntner) in Austria, the Piccola Accademia in Italy, the Clear Lake Symphony Orchestra, Houston Sinfonietta, the Moores School of Music Orchestras, Brazos Valley Symphony Orchestra and “Mercury – The Orchestra Redefined” in the United States. She has taken part in masterclasses with Gustav Mayer, Helfried Fister, Rainer Kussmaul, Igor Ozim, Andrzej Grabiec, Giovanni Guglielmo, Lorenzo Fava, Isabelle Ballot, Rainer Honeck, Joseph Silverstein, Stephen Shipps, Lucie Robert and, for chamber music, Alois Posch, Sean Y. Wang, Domenico Nordio, Alberto Vianello, Debussy Quartet, and Timothy Hester. In the summer 2012 she took part to the Chile tour of the YOA (Youth Orchestra of Americas), and she performed concerts in Medellin (Colombia). 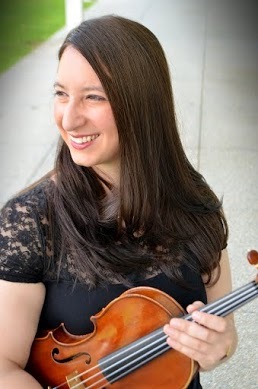 She is currently teaching and freelancing in Houston as a violinist and a violist. She is also a founding member of the Houston-based Calliope String Quartet, which is scheduled for a concert tour of Italy, Austria, and Slovenia this July.